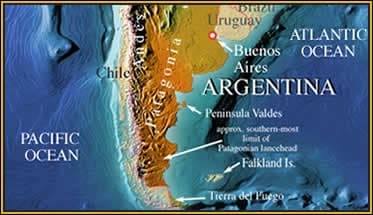 Location: The Patagonian lancehead occurs as far south as southern Patagonia, where it is very rare. The Patagonian lancehead is the southern-most snake species in the world, occurring practically all the way down to Tierre del Fuego. A small and elusive pitviper with an upturned snout, Mark’s quarry is by no means easy to find in the vast Patagonian wilderness. Nobody is currently studying this interesting little pitviper so Mark is accompanied by Monique Halloy, an expert on its lizard prey, and her student Juan Carlos, since Mark thinks finding the lizards the snake eats will be the clue to finding the snake itself. Marcio Martins, a Brazilian pitviper expert, joins the team because he has always wanted to see a wild Patagonian lancehead to compare with a related species he has studied in Brazil. The quest takes the four herpetologists through the expanse of Patagonia, from inhospitable salt pans to wild-swept coastal beaches, home to Argentina’s penguin and sealion populations. 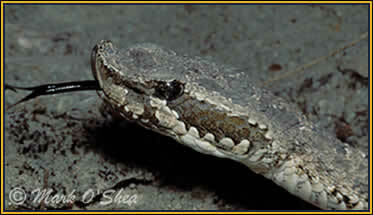 A close view of the head of a Patagonian lancehead (Bothrops ammodytoides) note the upturned snout.